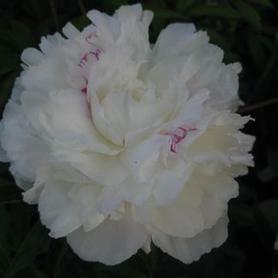 'Festiva Maxima' Herbaceous Peony has fragrant double white flower with red speckles. 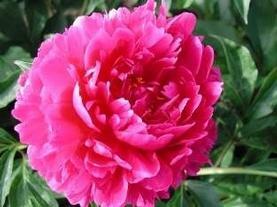 This is a classic Peony which has come back into popular use. It was originally bred for the cut flower trade. 'Karl Rosenfield' Garden Peony has double red blooms. It blooms early in the season (May and June), which makes the double flowers last better because of the cooler temperatures. 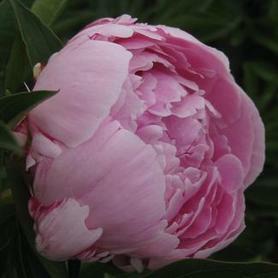 'Sarah Bernhardt' Garden Peony has double pink blooms. 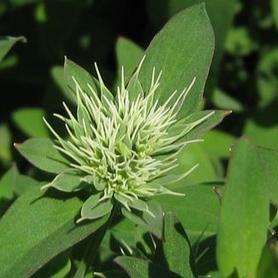 The fragrance is good and the early season blooms make great cutflowers. 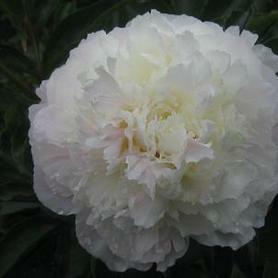 'Shirley Temple' Garden Peony has double white flowers which are very showy. 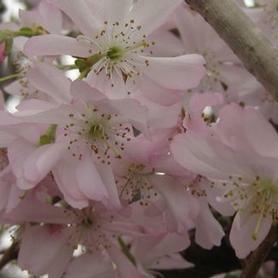 The fragrance is excellent, and since it blooms early in May and June, the double flower performance is dependably good. 'First Arrival' Itoh Peony was introduced by Roger Anderson of Wisconsin in 1986, but the intersectional Peonies have only become well known fairly recently. 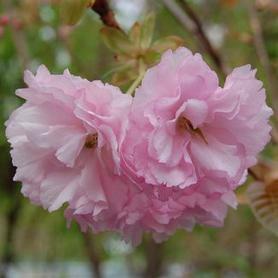 'First Arrival' produces large ruffled pink flowers in late spring and early summer over clean green foliage. 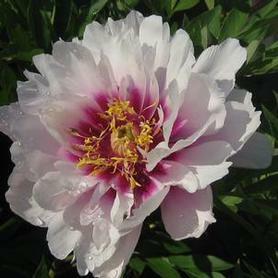 The Itoh Peonies combine the best characteristics of both parents, with mildew resistant leaves and compact tight habits. Their long bloom period makes them a welcome addition to perennial borders. 'Bartzella' Itoh Hybrid Peony has sulfur yellow double flowers in May and June, held on short stems above green disease-resistant foliage. The blooms have red center flares on petals, and 'Bartzella' makes a lovely short cut flower. Roger Anderson of Wisconsin introduced Paeonia x 'Bartzella' in 1986, after years of hybridizing work. 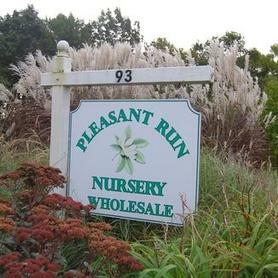 PRN Preferred: A heavy bloomer with bright yellow flowers. Since is it an Itoh, the foliage looks good all season long. 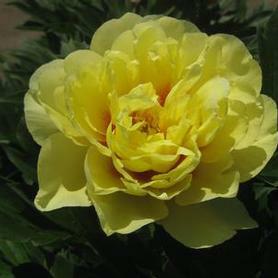 'Border Charm' Itoh Hybrid Peony has bright yellow single flowers made more showy by red flares at the base of the petals. Paeonia x 'Border Charm' blooms profusely in May and June, and makes a lovely short cut flower. 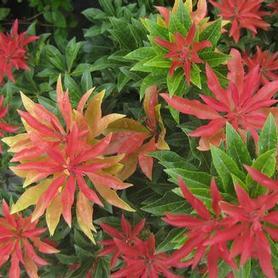 Since Tree Peony is one of the parents, the foliage is a good disease-resistant green, on short woody stems. 'Border Charm' was hybridized by Don Hollingsworth. 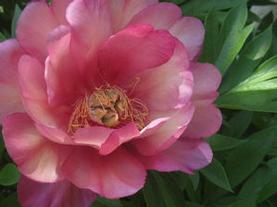 'Cora Louise' Itoh Hybrid Peony is one of the more vigorous Itoh introductions, bred by Roger Anderson of Wisconsin. 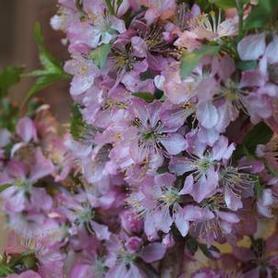 It combines excellent hardiness with extremely large showy blooms. The 10" flowers have white petals which are maroon at the base, surrounding the yellow stamens. The form is semi-double and the flower production in May is plentiful. Like all the intersectional Peony hybrids, Paeonia 'Cora Louise' is a wonderful tough addition to the perennial garden. 'Old Rose Dandy' Itoh Hybrid Peony blooms in May and June, with large single copper petals enhanced by brick-red flares and yellow stamens. Since 'Old Rose Dandy' is an intersectional hybrid between Tree Peonies and Herbaceous Peonies, the woody stems are quite short and are vigorously covered with handsome disease-resistant foliage. A cross by Chris Laning in 1993. We grow an outstanding selection of unique Garden Peonies, many of which we have grown for years in our own gardens with great delight. Heights range between 2 and 3' and plants are hardy to zone 3 and 4. Unusual flower forms, both double and single, make great cut flowers. All are deer resistant! Please visit the website for specific varieties and descriptions. The Peony World has found a significant Holy Grail with the introduction of beautiful crosses between Tree and Garden Peonies. Toichi Itoh of Japan made the original breakthroughs in 1948, but selections resulting from this work have only recently become available. The flowers range from semi-double to double, in clear bright colors from pink, yellow, and lavender to orange, rose and red. 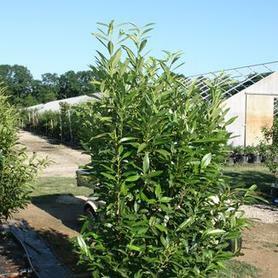 The habit is somewhere between the two species, with short woody stems and vigorous green deciduous foliage. See our availability list for specific varieties. 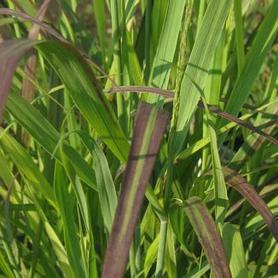 'Heavy Metal' Switchgrass has blue-green foliage that is very upright, with attractive seedheads appearing in July and lasting throughout the winter. 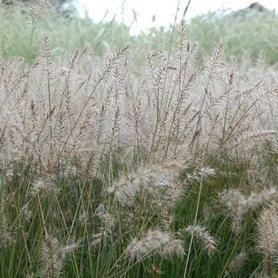 One of the earliest Switchgrasses introduced to the trade like all the Panicums this is an important seed source to feed winter birds. Selected by Kurt Bluemel. 'Northwind' Switchgrass has green-tan seedheads above blue-green foliage with a very upright habit. Introduced by Roy Diblik of Northwind Perennial Farm in Wisconsin. 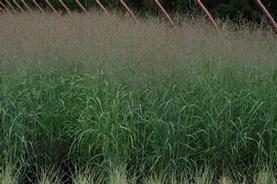 Our favorite upright Panicum, and the perfect tall grass for tight spots. An excellent tan in the winter. 2014 Perennial Plant of the Year. Bruce Neary of BCN Horticultural Services loves 'Northwind' because it never flops. 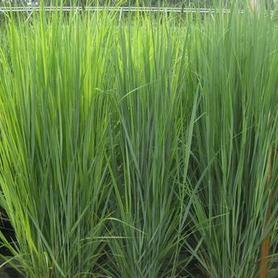 PRN Preferred: A reliably upright Panicum with very attractive blade color. 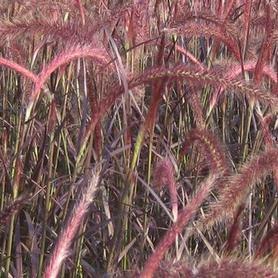 'Shenandoah' Switchgrass has reddish-tan seedheads above reddish-green foliage with burgundy tips. The fall color is a burgundy-red, turning to a soft tan in winter. 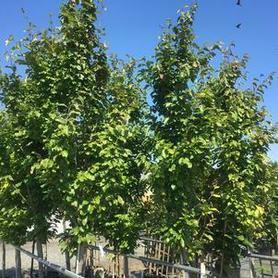 Selected by Dr. Hans Simon in Germany and brought into this country by the US National Arboretum. Important food source for winter birds. PRN Preferred: One of the shortest and showiest Panicums, with red blade tips in early summer. 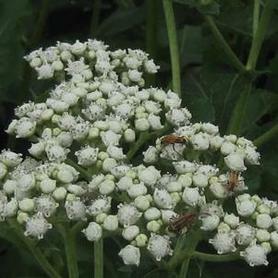 Wild Quinine or Feverfew is an interesting native perennial with a number of unusual small wooly white flowers borne in flat-topped showy corymbs. 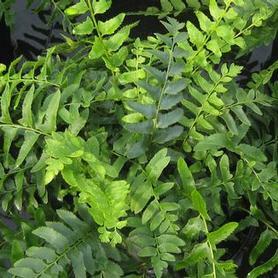 The fragrant green leaves are contrastingly large, making a good setting for the delicate long-lasting blooms. Parthenium has a very long flowering period from late May into August, making it a wonderful back-of-the-border perennial or woods edge softener. 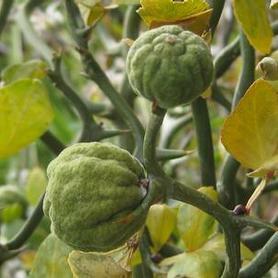 Formerly used as a medicinal plant, Wild Quinine is unpalatable to deer and other pests. 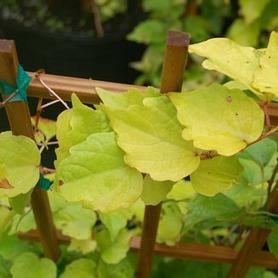 'Fenway Park' Boston Ivy has bright yellow leaves that turn to lime-green in summer and brilliant scarlet-red in fall. 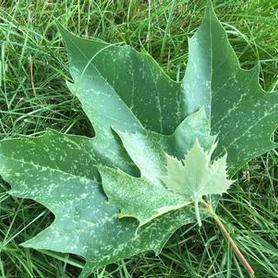 It was found by Dr. Peter Del Tredici of the Arnold Arboretum near the famous baseball stadium as a chance sport of Parthenocissus tricuspidata. Boston Ivy is salt tolerant. 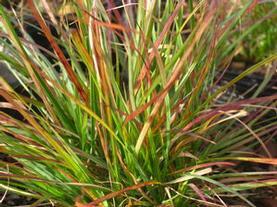 ‘Burgundy Bunny’ Miniature Fountain Grass has delicate green leaves which are tipped with burgundy. The short creamy seedheads are produced in July and last into the winter. Fall color is a bronzy-red. Good drainage is necessary for winter survival. 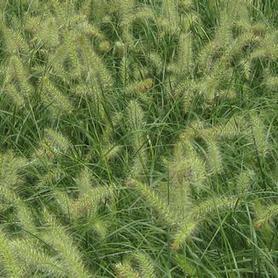 Bred by Walla Walla Nursery and introduced by PlantHaven® Inc.
'Cassian' Fountain Grass has light gold seedheads above fine green foliage. The seedheads are a little more colorful than 'Hameln' when they first emerge. Introduced by Kurt Bluemel. The winter foliage is a pale tan. 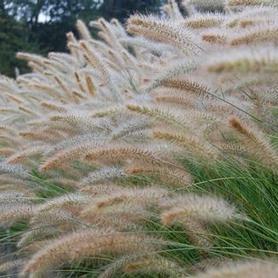 'Hameln' Dwarf Fountain Grass has creamy white seedheads, above fine green foliage. This is the most well-known of the Pennisetums, and a real workhorse. Like all Pennisetums, 'Hameln' does best with good drainage. The thin leaves take on an ivory winter color. 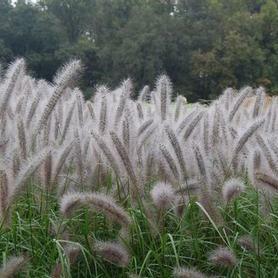 'Red Head' Fountain Grass has huge smoky burgundy bottlebrush seedheads above wide green leaves. Earlier blooming than 'Moudry' and showier. 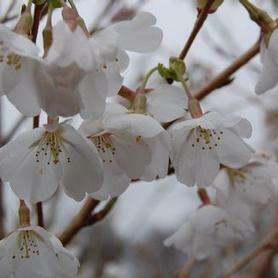 Selected by Brent Horvath from seedlings of P. 'National Arboretum'. It really turns heads when in bloom, and the winter foliage is attractive. 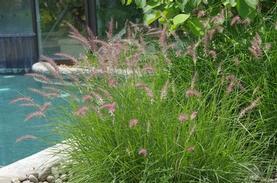 'Karley Rose' Oriental Fountain Grass has very colorful rose-pink inflorescences over green foliage. 'Karley Rose' blooms all summer, with the older seedheads becoming a dark tan. This grass has an open habit. 'Blackbeard' Beardtongue has beautiful foliage in shades of eggplant and dark purple. The color stays intense throughout the summer and is topped by deep purple stems bearing showy lilac to pink open faced flowers. Penstemon 'Blackbeard' makes an excellent long lasting cut flower, and when finished blooming in the garden, the seedheads remain deep purple and attractive. A Walters Nursery introduction. 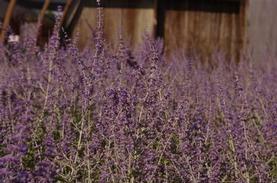 'Denim 'n' Lace' Russian Sage produces sky blue flower spikes for an extended period in mid to late summer. 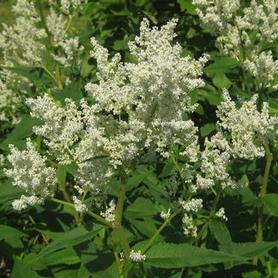 The lacy blooms are produced on the tips of strong stems with grayish green airy aromatic foliage. The individual blue flowers on the spikes of 'Denim 'n' Lace' Perovskia are closely spaced so the clumps look fuller than other Perovskias, and the lavender calyces remain showy after the flowers are finished, extending the ornamental qualities. Excellent drainage is a must for this new introduction from Walters Gardens. 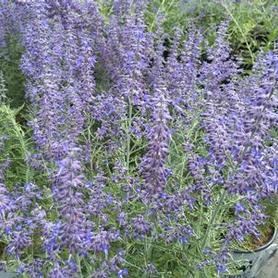 'Little Spire' Russian Sage has blue flowers in July and August, over silver-green aromatic foliage on a compact form, and is dry site tolerant. From Herbert Oudshoorn of Holland. 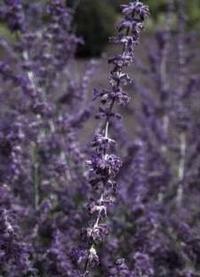 'Superba' Russian Sage has blue flowers in July and August and silver-green fragrant foliage. It is dry site tolerant. 1995 Perennial Plant of the Year. 'Firetail' Fleece Flower has deep red flower spikes July through September. 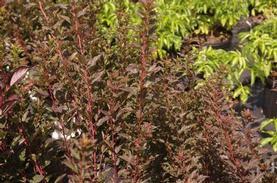 Persicaria amplexicaulis 'Firetail' makes a large clump but is not an invasive spreader. Moist site tolerant. Bruce Cole loves this plant, and so do we! It never stops blooming once it starts. Giant Fleece Flower has ivory-white plumes in June and July. 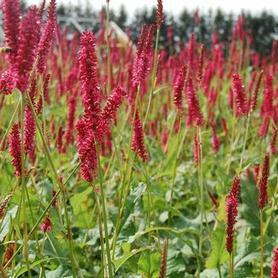 Persicaria polymorpha is a trouble free, large clump former, not an invasive spreader. Fall foliage is often colorful. A Wolfgang Oehme favorite plant. Both wet and dry site tolerant. 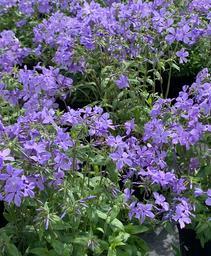 'Blue Moon' Woodland Phlox blooms in April and May, producing large violet blue fragrant clumps of flowers on delicate stems. Phlox divaricata 'Blue Moon' is a particularly showy example of our native groundcover, naturalizing well in woodland settings. An introduction by the New England Wildflower Society. 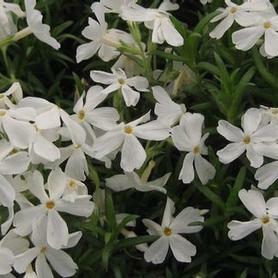 'David' Garden Phlox has fragrant white flowers in July and August and disease resistant foliage. 2002 Perennial Plant of the Year. 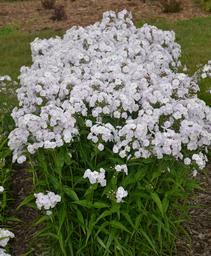 From FM Mooberry of the Brandywine Conservancy, where Phlox paniculata 'David' was found as a seedling. 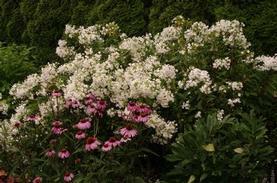 'Glamour Girl' Garden Phlox blooms prolifically in mid to late summer. The bright coral pink flower panicles are displayed on dark stems above mildew resistant green foliage. Phlox paniculata 'Glamour Girl' has a lot to offer mixed perennial borders, with height, fragrance and butterfly and hummingbird appeal. An introduction from Walters Garden's breeding program. Will rebloom if deadheaded right after the first bloom flush. 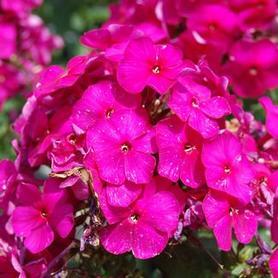 'Jeana' Garden Phlox is an unusually mildew-resistant Phlox with bright lavender-pink flowers which have a sweet fragrance. 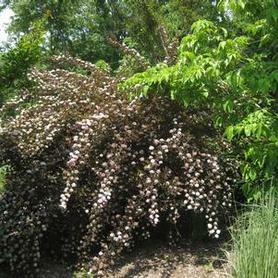 'Jeana' blooms for an extended time from mid summer to early fall. It was found by (and named after) Jeana Prewitt of Nashville, Tennessee, and the North Creek people got us all enthusiastic about it. PRN Preferred: Have trialed Jeana for many years. 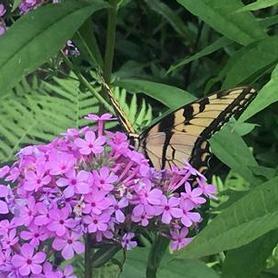 Its foliage remains clean all season and it attracts the most butterfies of all the Phlox we grow. The best performing Phlox in Mt. Cuba's Phlox trials. 'Laura' Garden Phlox has fragrant plum-purple flowers with white eye zones, appearing in July and August for an extended show. 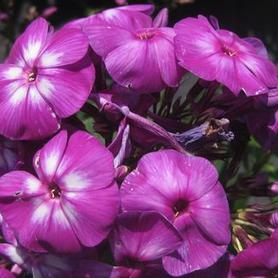 'Nicky' Garden Phlox has fragrant deep magenta-purple flowers in mid summer. 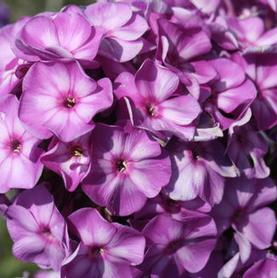 Its very intense color make this and 'Laura' the favorite Phlox of Nanci Angle of Lawrence Landscapes. Introduced by Niche Gardens. 'Orange Perfection' Garden Phlox produces large clusters of bright salmon orange fragrant flowers for 4 weeks in July. These vividly colored panicles make an excellent cut flower. If cut back several inches in June, the flower display will be somewhat later, blooming in August when little else in the mixed border offers such bright colors. Plant where the air circulation is good to keep foliage clean. 'Pixie Miracle Grace' Garden Phlox has fragrant, lavender-purple flowers with star-shaped white eyes in July and August on a mildew resistant compact plant. 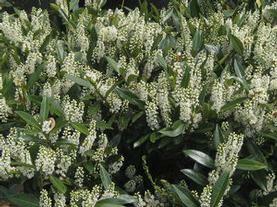 PRN Preferred: We love the compact clean habit and the white 'eyes' of the blooms. 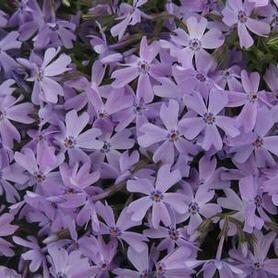 'Blue Ridge' Creeping Phlox produces a fine mat of green foliage covered with clear blue flowers in April and May. A lovely addition to the early spring garden. All Phlox stoloniferas are dry site tolerant when established. 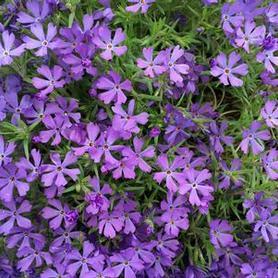 'Sherwood Purple' Creeping Phlox has vivid purple flowers in April and May covering the vigorous green foliage. 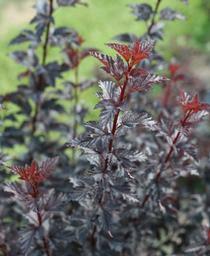 North Creek Nurseries considers it the best groundcover of the P. stolonifera group. The flowers in April of 'Candy Stripe' Moss Phlox are pink and white stripes, over creeping thread-like green foliage. Needs good drainage. 'Emerald Blue' Moss Phlox is covered with lavender blue flowers in April. 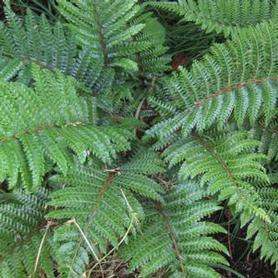 Creeping green thread-like foliage is perfect for rock gardens and around walks. Prefers good drainage. 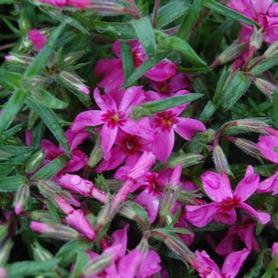 'Scarlet Flame' Moss Phlox has scarlet-rose flowers in April over creeping green thread-like foliage. Works well in rock gardens. Needs good drainage. 'Snowflake' Moss Phlox becomes covered with white flowers in April over creeping green foliage. Excellent for rock gardens, walls and paths. Best in well-drained soil. 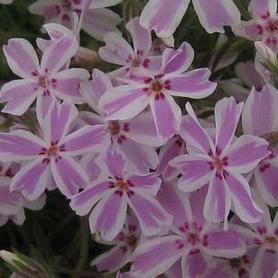 'Fashionably Early Crystal' Garden Phlox is another beauty from the prolific plant breeder Hans Hansen. A cross between P. maculata and P. paniculata, 'Fashionably Early Crystal' combines great attributes of both parents. The thick leathery leaves are narrow and highly disease resistant, and the habit is stoloniferous, the large fragrant flowers are white with tiny lavender eyes, and produced in quantity for a month in early summer. If deadheaded, there is often some reblooming in fall. 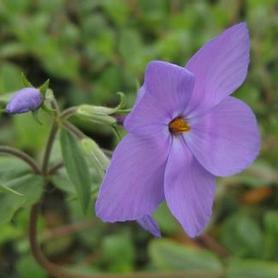 'Violet Pinwheels' is a beautiful Moss Phlox hybrid from Dr Jim Ault and Chicagoland Grows®. The habit is low and similar to Phlox subulata, but the flowers are a bright violet, a color hard to find in the subulatas. The petals are large and finely notched, resembling their "Pinwheel" name. 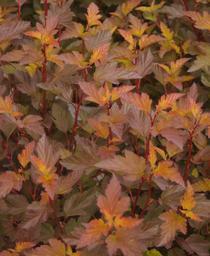 This exciting new color option would look excellent in rock gardens and around garden paths. Needs good drainage. 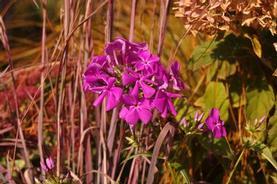 'Wanda' hybrid Phlox was shared with Alan Armitage by the gardener who found this spontaneous seedling in her garden. During the testing in the UGC trial gardens, its long flowering period and number of pink blooms really made Phlox x 'Wanda' a standout. The habit is compact and full, with good disease and heat resistance. 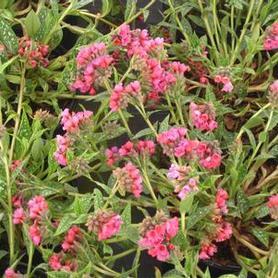 'Wanda' would make a great container plant because it blooms most of the summer. 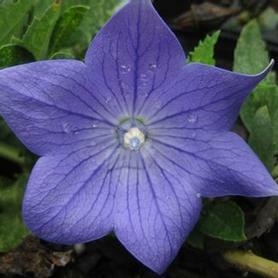 'Sentimental Blue' Balloon Flower has large blue balloon shaped flowers in July and August, over a dwarf habit. 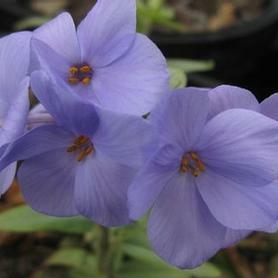 Platycodon grandiflorus 'Sentimental Blue' reblooms well, and prefers a well-drained site. 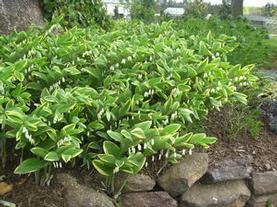 Variegated Solomon's Seal has white flowers in the spring, over green leaves with white edges. Polygonatum odoratum 'Variegatum' likes moist sites and will colonize slowly to form a large patch eventually. It is also surprisingly dry site tolerant. 2013 Perennial Plant of the Year. Longleafed Lungwort has violet-blue flowers in April and May over long silver and green mildew resistant leaves. Originally found in the Cevennes region in France. The toughest of the Pulmonarias. 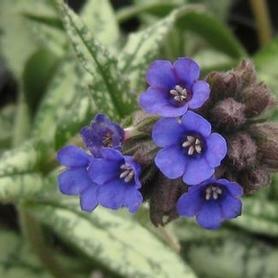 'Dark Vader' Lungwort produces sprays of delicate open faced flowers in shades of blue-purple and pink. 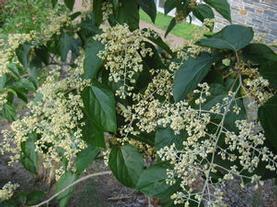 The blooms appear in April and May, and are displayed over showy fuzzy foliage of dark green with silver spots. 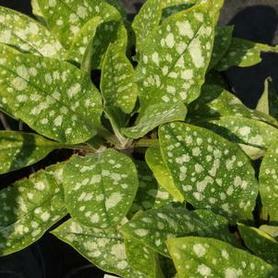 The leaves are rounder and shorter than Pulmonaria var. cevennensis, but are equally mildew resistant. Pulmonarias prefer cooler temperatures, so they are at their most showy in spring and fall. Pulmonaria x 'Dark Vader' is a wonderful candidate for woodland naturalizing. 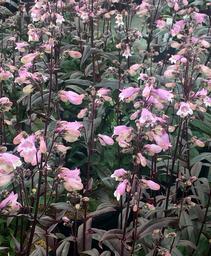 'Raspberry Splash' Lungwort has raspberry-pink flowers in April and May, and silver spots cover the long green leaves. A tough Pulmonaria. 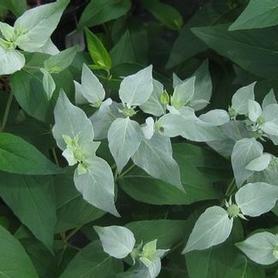 Appalachian Mountain Mint has attractively fragrant foliage topped by spiky round silver-white flowers in late summer. The blooms are highly attractive to butterflies. Since Pycanthemum flexuosum spreads by underground stolons, it does a good job on slopes and stream sides. 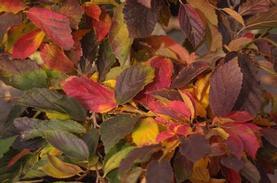 The fall foliage color takes on shades of red for added interest. Wet site and shade tolerant, as well as deer resistant. As the summer advances the new leaves of Mountain Mint take on a silvery-white coloration to the point where they look like small white Poinsettias. The small pink flowers are a great butterfly attractant, and the foliage is deliciously aromatic. This plant is one of the significant late summer beauties on the High Line in NYC. Its rapid growth habit makes Pycnanthemum muticum a great groundcover. 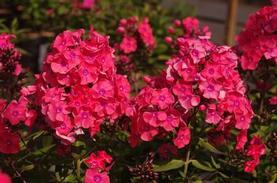 PRN Preferred: Attracts the most pollinators we've ever seen, very critter resistant.